All transactions are safe and secure with a reliable history in online purchasing behind each of our associates. 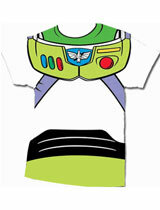 Buy the Buzz Lightyear Costume t-shirt to own Toy Story clothing and merchandise. Buzz may not have as fast of a draw as Sheriff Woody, but he does have the ability to fly, at least that's what he thinks. Along with his best friend Woody, he can tackle any problem. Let him know that you want to go to infinity and beyond by getting this Buzz Lightyear costume tee. Pair it with a similar Toy Story Woody t-shirt. If that isn't good enough, then snag the full Toy Story Jessie costume, Buzz or Woody costume below. You could also create your own adventures with the Toy Story toys and merchandise. In addition to the Buzz Lightyear Costume tee above, browse the Toy Story Clothing Gallery for more apparel like men's and women's clothes, kids shirts or hoodies.